Claims storage filing area at the VA Regional Office in Winston-Salem, N.C. The Department of Veterans Affairs has been dogged for years by complaints that the claims process is painfully slow. Now, a recent inspection by the VA Office of Inspector General shows exactly how difficult it can be to physically manage the volume of those cases. 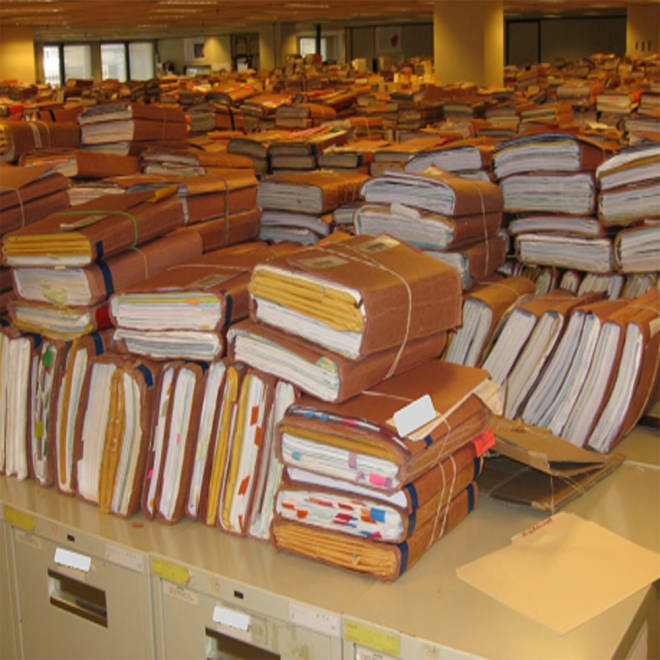 At the VA's Winston-Salem Regional Office in North Carolina, an estimated 37,000 claims folders had been stored on top of file cabinets, according to the Inspector General's report released last week. Those piles had been stacked two feet high and two rows deep. The file cabinets were so close to each other that drawers could not be opened completely. More files had been stored in boxes on the floor and stacked along the wall. A load-bearing study found that the weight of the files exceeded the floor's capacity by 39 pounds per square foot. "The excess weight of the stored files has the potential to compromise the structural integrity of the sixth floor of the facility," said the Inspector General report. "We noticed floors bowing under the excess weight to the extent that the tops of file cabinets were noticeably unlevel throughout the storage area." Inspectors found that the filing system had created an "unsafe environment" for employees; one worker suffered a minor shoulder injury in 2011 when folders fell from a filing cabinet. The filing system also put the records at risk, potentially exposing them to fire and water damage as well as loss and misplacement. The inspection of the office was conducted in May as part of a nationwide effort to evaluate regional offices. The Winston-Salem Regional Office, with 680 employees, serves more than 770,000 veterans in North Carolina. The state is home to six military installations, including Fort Bragg and Camp Lejeune, which rank sixth and eighth, respectively, in the largest number of discharges in the country. Staff at the office began having trouble storing files in 2005 when that location, as part of a national initiative, started collecting and processing disability claims prior to a service member's discharge. The office was one of two regional centers in the country to handle such cases, according to the Department of Veterans Affairs. Staff tried to transfer or retire 50,000 files in recent years, as well request more storage space. The office was denied extra room because of a lack of money and few external storage options. Filing cabinets at the Winston-Salem Regional VA Office in a photo provided to NBC News on August 14, 2012. In June, after learning that the floor load exceeded capacity, the office removed all folders sitting on file cabinets and placed them on separate floors. The office also intends to purchase a high-density file system for the basement, which will cost an estimated $405,000. "We are on track to comply with (the report's) recommendations," the Department of Veterans Affairs said in a statement to NBC News. VA is working with the Department of Defense to create an integrated electronic medical record that could be used between both agencies, but it will not launch until at least 2017.